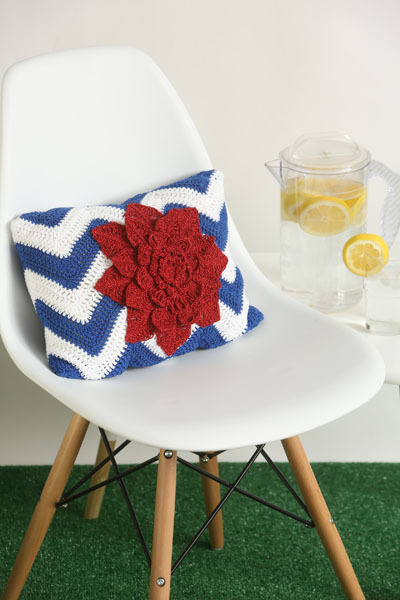 A simple chevron stitch is used to make the base of this pillow in brightly colored cotton yarn. 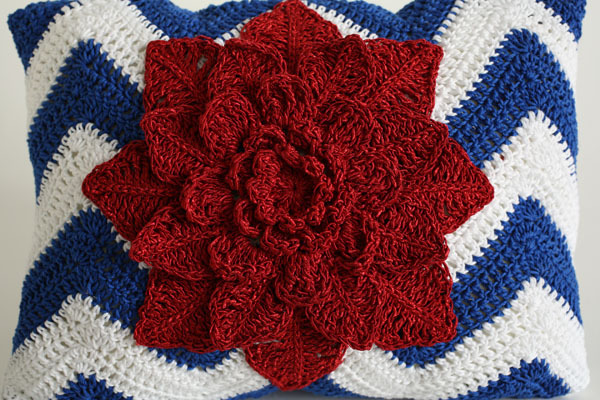 Cue the fireworks with a bursting red flower made with yarn that has a beautiful sheen. 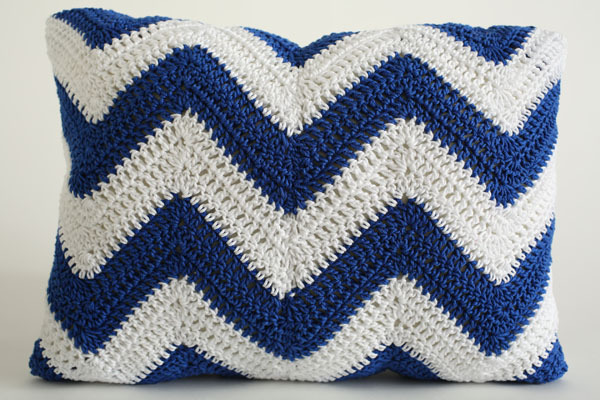 The pillow is made from a long rectangle of the chevron stitch made in alternating colors (every 3 rows), which is then sewn together to form pillow shape. The peaks created by the chevron stitch along the top and bottom are eliminated (and hidden inside) when straight edges of pillow are sewn. When changing color, leave about 6” for each yarn tail to use for assembly. When dc3tog at end of each row, the ch-2 turning chain counts as 3rd st.
Join with sl st to first stitch at end of each round of Flower unless otherwise stated. With Royal Blue, ch 153. Row 2: Ch 2, sk 1st st, dc2tog over next 2 sts, dc in next 9 sts, *5 dc in next st, dc in next 10 sts, dc5tog over next 5 sts, dc in next 10 sts: rep from * across to last 3 sts, dc3tog over last 3 sts. Turn. Rows 3–21: Repeat Row 2, changing color on Rows 4, 7,10,13,16 and 19. Round 1: With Garnet, work 16 dc in adjustable ring, join with sl st to first dc. With RS facing each other, fold chevron rectangle in half and sew together, making sure stripes match up and using all yarn tails. Use blue yarn tails for blue stripes and white yarn tails for white stripes. 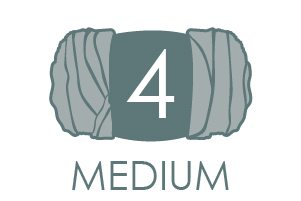 Shift rectangle so seam is in the center back of the pillow. 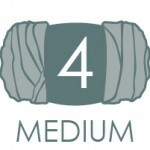 Using Blue yarn and needle, sew up one opening of tube in a straight line (see Diagram). 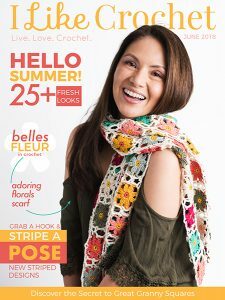 Using Garnet yarn and needle, sew flower to center of front of pillow. Sew up top opening of pillow with blue yarn and needle. Fold points of chevron stitch inward and use invisible stitch across. 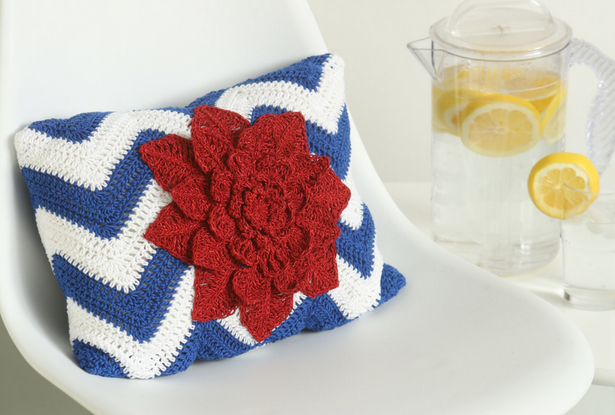 Using crocheted pillow base as a template, cut out 2 rectangle pieces of white cotton fabric. Sew up along all sides leaving a small opening for stuffing. Stuff with Fiberfil and sew up opening.